Gift Cards are the best options when it comes to showing your love for someone who lives afar. And even if not due to the distance, Gift Cards show that you respect their choices and are willing to give your special someone something that can totally make their day. And to be true, time is the best gift you can give someone; time is deemed to be the best gift after all, isn’t it? Why not gift them a great time with Book My Show Gift Card? Your special people are going to have the time of their life watching the best movies, attending the best events in the city. You’ve got to try them out now! 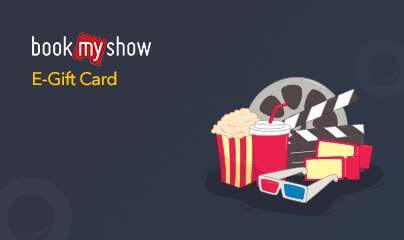 BookMyShow Gift Cards Now Available On GrabOn! The best form of entertainment are undoubtedly movies and Indians love movies! With BookMyShow, watching movies is a piece of cake. Book your tickets easily on their user-friendly app or website, and get access to the best seats and snacks while you have a great time. And now, don't just limit this ease of access to yourself. Spread it across with everyone with BookMyShow gift vouchers! You can buy a gift card of your choice, depending on your gift budget and just email it to them. How easy and cool is that! Which Theatres Can I Book Tickets For Through BookMyShow? Most of them! From PVR cinemas to INOX, from IMAX to the local screens of individual cities all have their tie-ups with them. If you have your favorite movie hitting the cinemas soon and you don't want to risk being stuck with bad seats, book your tickets using a BookMyShow! You can also use their vouchers and choose the seats of your preference! Be it munching food in the movie or tickets, through BookMyShow, you can have it all! And through our eGift Card, you can ensure not to worry about pulling your wallet all the time! Why Should I Choose A Book My Show Gift Card? Whether we are talking about Hollywood hits or Bollywood dhamakas or maybe something of local flavor, the movie buff is always up for a movie break. And what would this movie buff want more than the option to run off to any movie at a whim and that too for free? What's even better for them is the fact that they don't have to wait in long lines for their ticket or fear missing the starting of the movie waiting at the kiosks to get a printout, with the app now sending the confirmation message on your phone and the QR code on your WhatsApp from the BookMyShow business account. You can just show the code at the entrance and walk in hassle-free. Gift Cards For Events, Concerts, And More! You can find the coolest stuff on their website/app and Gift Cards for them as well. Have a friend's birthday coming up? You now know the perfect gift for her! Thanks to GrabOn. As it brings you the best offers, deals, and discount from BookMyShow! 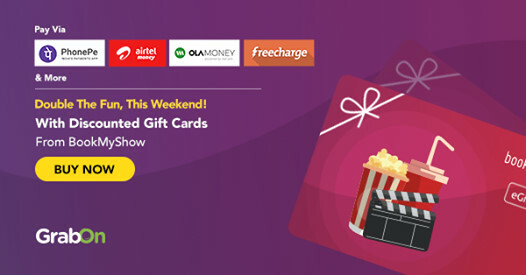 Grab the best of the offers based on your needs and requirements, catch awesome movies and fantastic events with your loved ones or gift the BMS gift card to someone so they can do the same. Don't forget to remind your loved ones to check the GrabOn offers page while gifting them the Bookmyshow gift voucher, so they can buy more and save in the process too! How to add gift card on BookMyShow? After you are done selecting your movie and food, go to the checkout page. In the payment option, there will be a "Gift Voucher/Card" option available . And it's done! The balance of the gift card will be deducted from your total price. You can redeem the gift card later if there is some money left for it to be used later. Can BookMyShow Vouchers be used India? Yes. These gift cards can be used only in India. Check our Terms and Conditions for more details. What can I do with a BookMyShow Gift Card? 1. How does one redeem a BookMyShow gift card or voucher? The BookMyShow gift card will be sent to the respected recipient once your payment transaction is complete. 2. Can I use my BookMyShow e-gift voucher or card to purchase food and beverages? No. This card is applicable only for booking tickets for movies, plays, concerts, and shows. 3. How can one use their BookMyShow gift card or voucher? In the payment page, choose ‘Gift Card’ or ‘Gift Voucher’ as your payment option. Enter your 16 digit BookMyShow gift card number and the corresponding 6 digit PIN number while making the payment of your order to redeem your gift card. 4. Can the BookMyShow Gift Cards be used with other payment methods? 5. What's my gift card balance and expiry date? 6. Can I redeem my gift card at the theatre or event venue? No. These gift cards can be only used for online purchases. 7. Which websites can I use my BookMyShow gift cards at? PVR, O2 Spa, Water Kingdom, Adlabs Imagica, TicketNew and more. What happens if I cancel my purchase but my amount gets deducted? Gift Voucher can be redeemed ONLY on bookmyshow website & mobile app. They cannot be redeemed directly at the cinema/venue box-office. Gift Voucher can be redeemed on purchase of eticket(s) for Movies/Plays/Concerts/Sports Or Merchandise (if any) available on bookmyshow. If lost misused, the Gift Voucher(s) cannot be replaced. Void if resold, cannot be exchanged for point(s) or cash and cannot be re-validated once past expiry date.